From pool decks and patios to basement floors, our coating systems offer the best in quality. Concrete coatings are fairly common in commercial facilities, but they can also be very effective in residential spaces. At Tight Line Concrete Coatings, we’re proud to offer a wide variety of Atlanta residential floor coatings that transform your outdated space into a beautiful, functional environment. Our installation technicians are true floor coating experts. We have been in business for over 10 years and have over 30 years of experience, so you can trust that we’ll install your flooring system correctly. When you choose Tight Line Concrete Coatings, you’ll be treated like a member of the family, and our BBB-accredited, top-rated business is committed to helping you bring your vision for a dream home to life. The time it takes to install your new residential flooring system can have a major impact on how much it will cost. Other installers may take days to finish your floor, which ultimately means it ends up costing you more money out of pocket. Instead of taking up your precious time with a lengthy, expensive installation, Tight Line Concrete Coatings is the only local business that offers professional Atlanta one-day residential coatings! 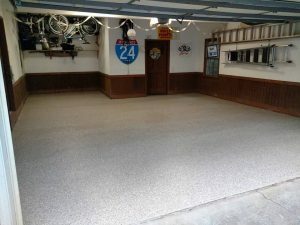 Garage floor coatings and other residential floor systems aren’t all created equally, and you need to ensure that you choose the right style to suit the needs of your space. With help from Tight Line Concrete Coatings, you’re guaranteed a beautiful, functional floor that lasts for a lifetime, and the process to get started couldn’t be easier! Just give us a call or fill out our online form, and we’ll get you set up with a free, no-obligation estimate.